"What to do about economic growth is perhaps the single most important question of our time, as the demographics of the developed world are shifting in such a way is that we will simply not have enough money for us all to be able to retire in the style to which we have been accustomed by our governments. An extra 1-2% of growth per year, however, can cover a multitude of structural secular sins. Just as true stagnation would transform even minor sins into those worthy of capital punishment. "As Dr. Woody Brock frequently notes, growth is a choice. And most of the choices that drive growth or hobble it have nothing to do with monetary policy. Monetary policy is just one part of the equation. The banter today about structural secular stagnation is more about making excuses for the failure of theoretical positions than it is about how to actually apply the mechanisms that would allow the “invisible hand” of Adam Smith to produce growth. "By ‘raising up a people of customers’ Smith means that focusing on overall economic growth and specifically on the growth of the income of individuals should be at the forefront of the social project. A government that does not allow for increases in productivity and thus an improvement in lifestyles will not be one in which the citizens are happy." Maudlin is right. The growth of income for individuals should be our first and foremost focus. The U.S. top marginal tax rate of 46 percent on individual income is above the average in the developed world of 41 percent and taxes a significant portion of business income. U.S. taxes on capital gains and dividends rank near the highest in the developed world. The U.S. corporate tax rate is the highest in the developed world at 39.1 percent and third highest in the entire world. The U.S. cost recovery system does not allow businesses to fully account for their costs. The U.S. worldwide international tax system is one of six of its kind in the developed world and taxes foreign income no matter where in the world it is earned. If we were to reform the tax code to address each of these issues, we would see more jobs and higher incomes, across the board. For example, a cut in the corporate tax rate just to 25 percent would grow the economy by about 2 percent. 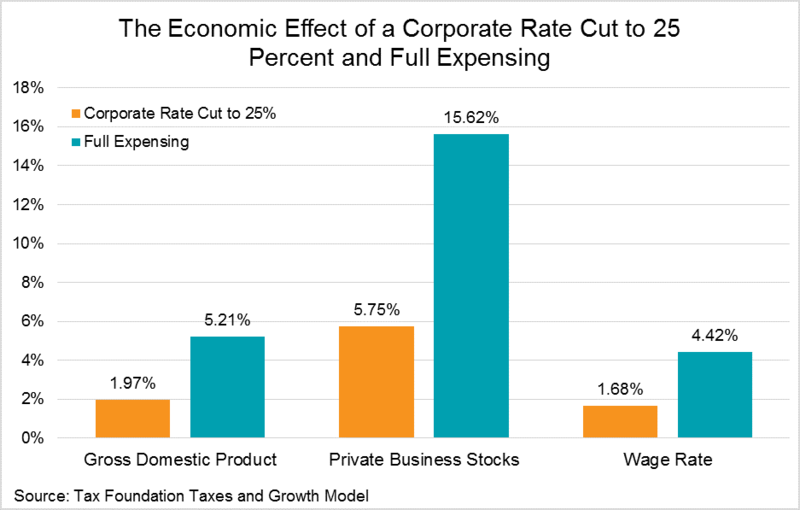 Likewise, a move to full expensing would grow the economy by over 5 percent and increase wages by nearly 4.5 percent. Countries around the world have taken steps to improve growth. All but three OECD countries (the U.S. being one) have lower corporate tax rates than in 2000 and 11 countries have moved to territorial tax systems. It’s time the U.S. takes steps to catch up.